One can assume that, with music, artists are going to keep going back, searching for genres, sifting through sounds and gems from past decades to blend together and will try to create something new and original for our young, scattered attention spans to grab on to. But there are some things that you find and you don’t mess with because, well, there’s no need. Prime example: Rockabilly Jazz and Imelda May’s convergence. 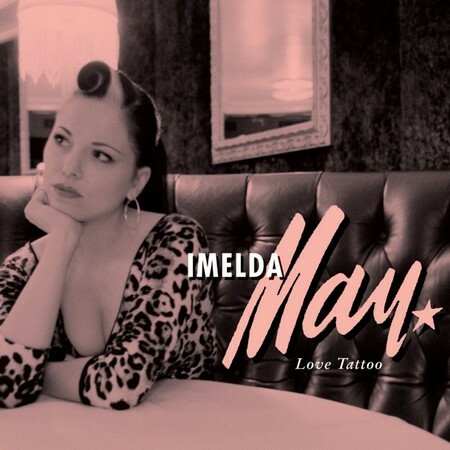 Jumping into this scene/genre without a hitch, Imelda May has taken her voice and meshed the swinging sounds of rockabilly romantics on her new album entitled “Love Tattoo.” Hailing from Dublin, Ireland, Imelda, 35, has been singing for years. She’s had another band, The Liberties, sings for The Candy Box Burlesque club in Birmingham and has shared the stage with several known artists like The Scissor Sisters, The Supremes, and Jools Holland. She’s even recorded another full-length album under her other name Imelda Clabby which she’ll be re-releasing after this album. After listening to this at my house, in my car, on my I-pod, in my bathroom, at the beach, pretty much everywhere, I’m going to go ahead and claim that this album is directly related and about her trails and tribulations she’s had with her guitarist/husband Darrel Higham and also suggest that the album title “Love Tattoo” is a clever metaphor for the “Love Tattoo” he seems to have left on her heart. (Call it a hunch). And trust me, she is not shy about expressing her love for him, and the influence, whether it be good or bad, he has on her life. She’s got a sass, a scratchy but tender voice that can pretty explore and hit on all ranges. She makes me think that she might be this year’s / next year’s Amy Winehouse. That’s how much of impression it had on me. But we’re hear to talk about the album. It kicks right off the bat with “Johnny Got A Boom Boom,” a fast bass line and some jazzy drums, and, after a few meters and some guitar, Imelda finally comes in slow and then picks up with the rest of the band in a full on swing song. “Big vibrations just one glass, gonna blow my mind” she says sultry, yelling at the end of the line. Then there are songs like “Knock 123” where Imelda puts herself out there, her, and her voice alone. “Look in my eyes, I’m your surprise” she says finally later with the band, teasing the audience. The song is slow and romantic; the piano carries the song until the end. Most of the songs on the album can be compared between these two. It’s either full on swinging jazz, or slow songs scattered between them. She spreads out and balances the feel of the album well though, which really makes the listener feel like they’re going through her experience with love and all she’s dealt with along the way.